Making candy bar cards is a sweet way to show your appreciation. It is fun to make and it is a great inexpensive gift. It is a unique gift that will leave a great impression. You can use it as the gift itself or as addition to the gift when you want it to be more than the usual. You can use the candy card as a unique teacher gift, as a Mother's Day or Father's Day present or as a Valentine gesture. It can also be a nice twist to the traditional birthday greeting card. Brain storm while you shop - Go to the local store. As you look over the candy section, think how you could use the candy's name in the wording of your greeting card. Great places to look for candies are the local grocery, Wal-Mart, discount stores or the drug store. Use bite sized candy pieces. They weigh less than the regular ones and they will make your candy placement easier. Greet your recipient - Write the wording of the card while weaving the candy names. Backing sheet - Get a backing sheet. You can use poster card, tag board, Styrofoam backing sheet or a heavy construction paper. Making the card - Plan how you want to place the words and the candies on the backing sheet. First write your message with pencil. Once you are happy with the placement of the card, write the message with markers and secure the candies. Use double sided tape, straight pins or glue gun to secure the candies. 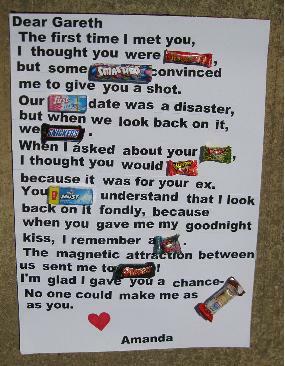 Made your own candy bar card? This is THE best place to brag about it and share it with the rest of us! Tell us who did you made it for and for what occasion, add your candy bar sayings and show us how creative you are! Hey, don't forget to add a picture of your card. Thank you!! !